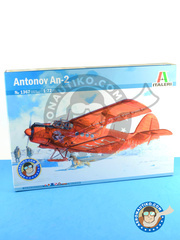 We've just made a hole at Aeronautiko for a couple of those World War I flying machines, the Nieuport 17 and the Sopwith Camel... but we will add more soon!!! 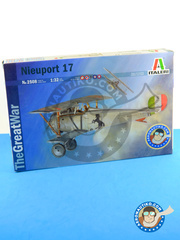 Italeri "The Great War" series scale model kit, reproducing the most interesting planes of the World War I. 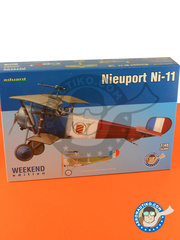 Such is the case of the Nieuport 17 in 1/32 scale, with an extensive parts break up and decals for reproducing 5 different decorations. 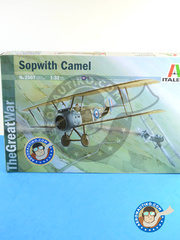 A gorgeous Italeri 1/32 scale model kit of the Sopwith Camel including, in addition to the usual plastic sprues, and extensive decals sheet printed in Italy by Zanchetti, and thread for simulating plane braces, wires and suspenders. 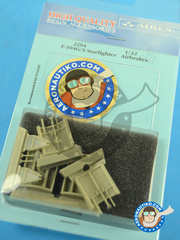 Enhancement set for Focke-Wulf Fw 190 Würger cockpit including several resin parts, a vinyl for the dials, and a set of photoetched parts. 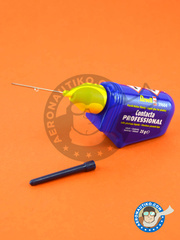 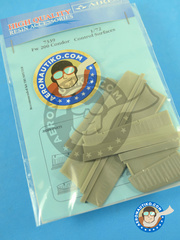 Resin parts for replacing the inaccurate flaps of Zvezda Yak-3. 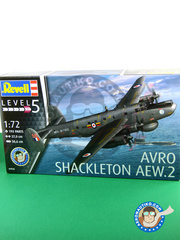 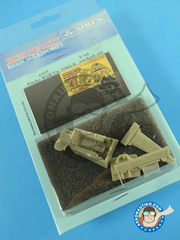 The kit includes an excellent panel detailing, as well as skids for the snow version and wheels for the airstrip landing version, and an extensive decals sheet for recreating 6 different decorations. 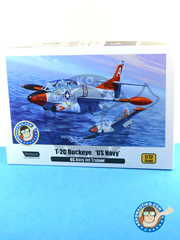 Here is this little scale model jewel of the North American T-2 Buckeye trainer. 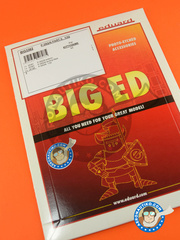 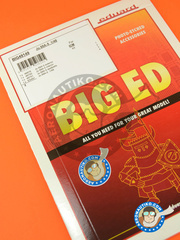 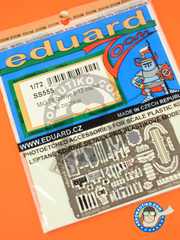 Gorgeous detailing and break up,Cartograf printed decals, amazing assembly instructions, and a very interesting look. 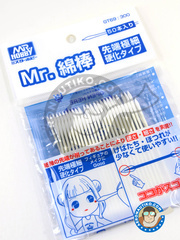 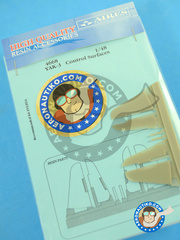 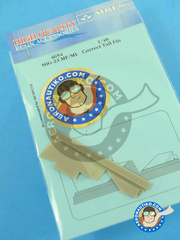 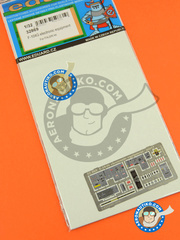 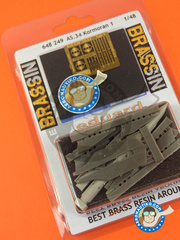 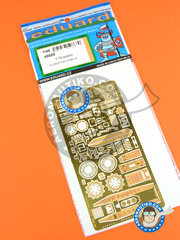 Resin parts set for replacing Trumpeter Mikoyan-Gurevich MiG-23 Flogger tail fin in 1/48 scale. 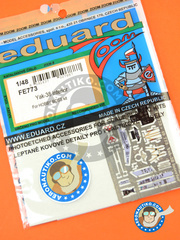 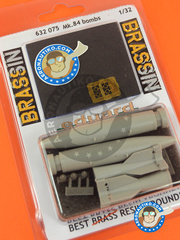 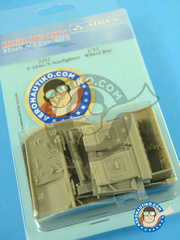 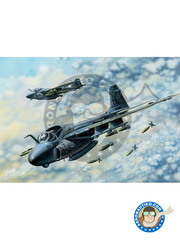 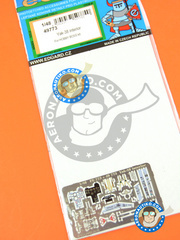 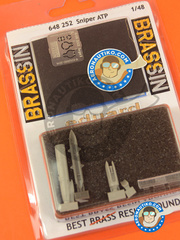 Enhancement set for airbrake pits of the spectacular Italeri F-104 kit. 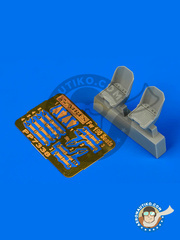 Enhancement set for Italeri F-104 landing gear bays. 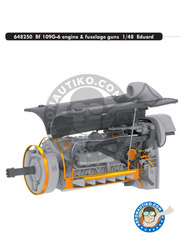 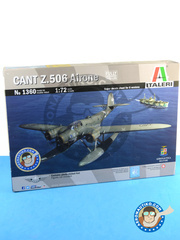 A new reedition with revised molds of Italeri Z.506. 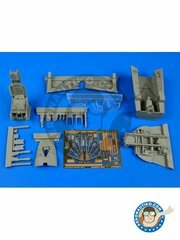 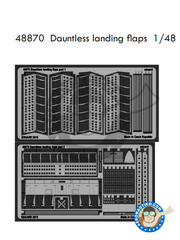 This version also includes a small photoetched parts sheet, includes detailed engines, a fully broken up interior, and operational bomb bay. 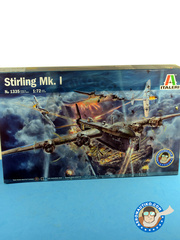 The decals include a very interesing decoration scheme for one RAF captured unit, as well as different Italian Regia Aeronautica units. 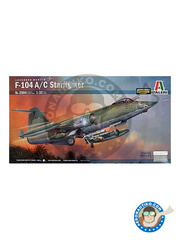 A great plan finally edited by Italeri in 1/72 with exquisite panels, an extensive decals sheet, and a few and very interesting decorations, including one unit captures by the Luftwaffe. 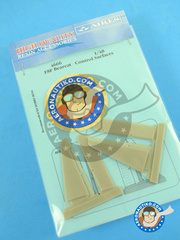 Make a hole in your workbench!! 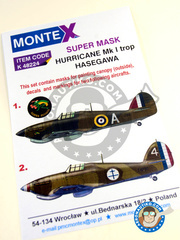 Set of 3 masks sheets and 1 decals sheet for recreating the decorations of either one Hurricane unit flying under the RAF flag in 1940 in the 3rd Squadron SAAF, or another unit flying in 1942 in the French Air Force GC1. 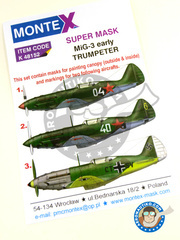 Set of three masks sheets for redecorating the MiG-3 just like it flew under Russian flag in 1941, or even like one unit captured by the German army that was tested by the Luftwaffe. 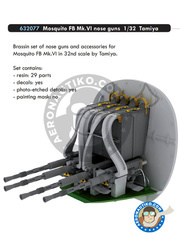 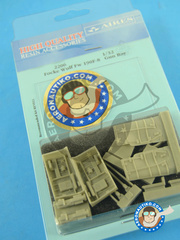 Set of resin parts for enhancing Revell Fw 190 F-8 gun bays in 1/32 scale. 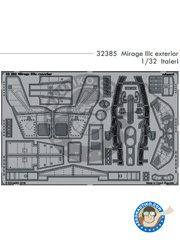 Enhancement set for Italeri F-104 G / S cockpit, including C2 seat. 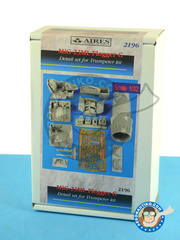 Set of resin and photoetched parts for correcting and enhancing the nozzle, landing gear bays and electronic bays on Trumpeter Mikoyan-Gurevich MiG-23ML Flogger G scale model kit. 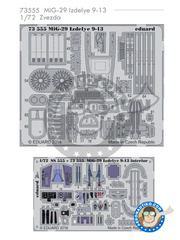 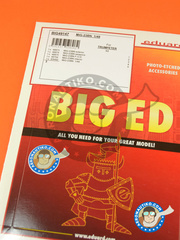 A mind-blowing kit in 1/32 scale by Italeri, featuring photoetched parts, hundreds of different parts, several Cartograf printed decals sheets, with a detail level and parts break up not usually seen, all this inside an enormous box that will cover half the size of your workbench. 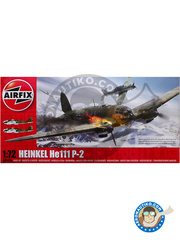 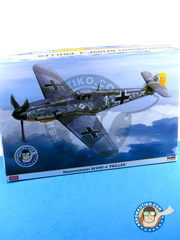 Hasegawa 1/32 scale edition of the Bf 109 F-4. 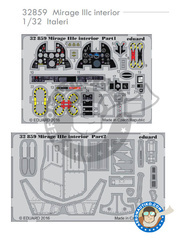 Inside the box you will find some excellent details such as the pilot figure, piece by piece broken up flaps, and a varied decals sheet.